See below the search results for Omis real estate for sale – The Omis Riviera and the town Omis are situated about 20km south of Split. Along the coast of the Omis Riviera there are several small tourist towns with lovely sand and pebble beaches, but what makes this area a fabulous holiday destination is the natural beauty of the Cetina river canyon and Omiska Dinara Mountain in the town’s hinterland. The area offers many possibilities for property buyers, there is a solid offer of apartments, houses, villas with swimming pool and building land for sale. In the towns one can find apartments and houses close to the sea and beach and there are fabulous villas with stunning sea view on the hillside above the towns. 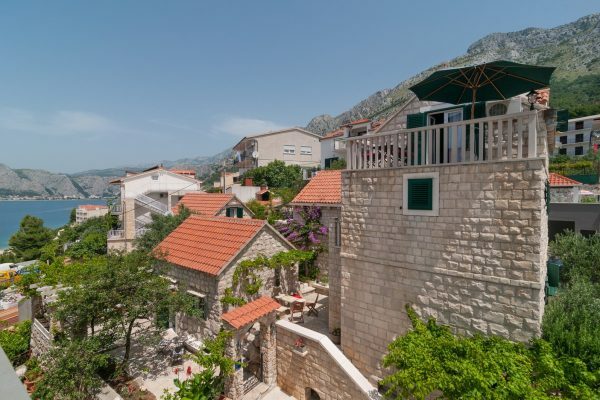 Property prices in Omis offer better value than those in Makarska, and it’s less hectic during the season. On average Omis property is perhaps 20% cheaper than Makarska although it does vary depending on the property and position. Like Makarska, the Omis coastline is dotted with beautiful pebble beaches. Properties in Omis which are close or next to a beach are highly sought after and come with a price to match. For more affordable property you need to consider buying something above the coastal road although bigger villas on larger plots up in the hills are expensive. Be it general information that you are looking for or details about some specific Omis real estate for sale, Omis property prices, market trends, the best places to buy property in the Omis area – we are here to help you find your perfect Omis property.